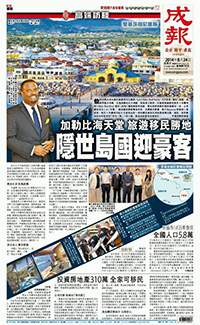 NIA CHARLESTOWN NEVIS (August 25, 2014) — In a second report on his visit to Hong Kong where he held meetings with hundreds of potential investors, Deputy Premier of Nevis Hon. Mark Brantley, described the media attention garnered from the meetings as tremendous. Mr. Brantley’s comment came from a second exclusive update from Hong Kong, given to the Department of Information on August 24, 2014. 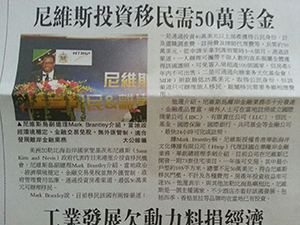 “The people of Nevis and the people of St. Kitts and Nevis in the wider context, would be pleased to know that my trip here has garnered tremendous attention from the local press in Hong Kong. “We have now been featured in three newspapers today. I was particularly pleased that a major, major piece was done on my trip and on St. Kitts and Nevis and Nevis more specifically, on investment opportunities available there. We now have seen three newspapers carry pieces on the trip thus far. I meet with some 300 or so investors in Beijing on Wednesday and thereafter, another 300 or so in Shanghai on Friday and then I return home on the weekend,” he said. 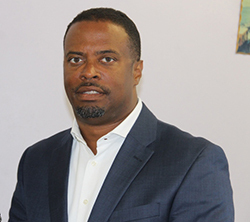 Mr. Brantley also noted his expectations that would come for Nevis as a result of his his meetings with interested investors. “The trip thus far has been very interesting but not just interesting, I think potentially very rewarding and I am very heartened at the appetite of the Chinese, to invest outside China and specifically to invest in the Caribbean and in St. Kitts and Nevis in particular. “So I believe that this trip has been useful and we expect that we will see some reward flowing from it for the good people of Nevis and St. Kitts and Nevis in the wider context,” he said. In conclusion, Deputy Premier Brantley stated that his visit to Hong Kong was part of the Nevis Island Administration’s (NIA) continued thrust to actively draw investors to the island. “I believe that this Government continues in its pledge to go out and interactively seek investment opportunities, to seek opportunities to make the lives of our people better. We were elected to serve and wherever we go, will continue to do our best for the people of Nevis,” he said.